Italian style coffee (caffè), also known as espresso, is made from a blend of coffee beans, often from Brazil. Espresso beans are roasted medium to medium dark in the north, and gets darker moving south. A common misconception is that espresso has more caffeine than other coffee but the opposite is true. The longer roasting period extracts more caffeine. The modern espresso machine, invented in 1937 by Achille Gaggia, uses a pump and pressure system with water heated up to 90-95°C (194-203°F) and forced with high pressure through a few grams of finely ground coffee in 25-30 seconds, resulting in about 25 milliliters (two tablespoons) of liquid. 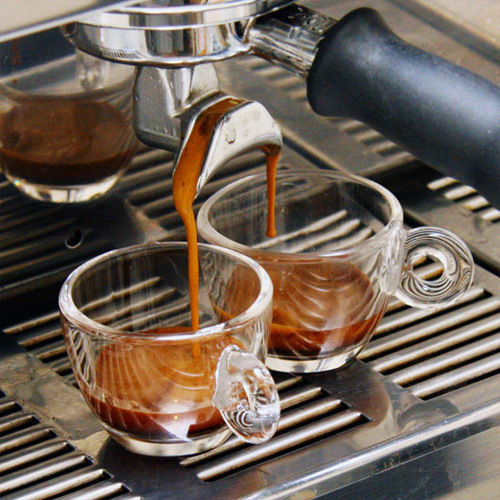 Home espresso makers are simpler but work under the same principle. 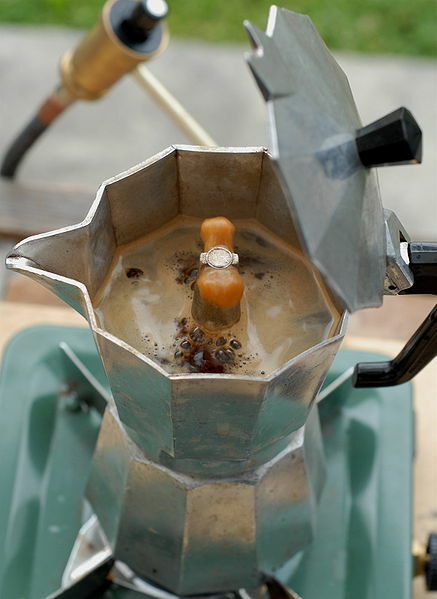 The Moka per il caffè is a three part stove-top unit that is placed on the stove-top with loosely packed grounds in a strainer, the water rises from steam pressure, and is forced through the grounds into the top portion. It is unlike a percolator in that the brewed coffee is not re-circulated. Left: Moka per il caffè. Espresso is usually served in a demitasse cup. Caffè macchiato is topped with a bit of steamed milk or foam; ristretto is made with less water, and is stronger; cappuccino is mixed or topped with steamed, mostly frothy, milk. Caffelatte is equal parts espresso and steamed milk, similar to café au lait, and is typically served in a large cup. Latte macchiato (spotted milk) is a glass of warm milk with a bit of coffee.